This post is a continuation of recent posts featuring bells. It also belongs to a series on Fables and other works featuring animals. Aesop (620 and 560 BCE) was a Greek story teller who told Fables. It could be that he also wrote the fables he told, but these appear to have been transmitted orally from generation to generation. They therefore belong to an oral tradition as is the case with fairy tales. It has been claimed Aesop was a “Levantin,” i.e. from the Middle East, that he was a freed slave, that he was forced to jump to his death or pushed down a cliff, but the truth is that we do not know whether or not there ever lived an Aesop. Aesop however is not the first Greek story teller to write fables. A “Goose with the Golden Eggs,”entitled “Une femme et une poule,” is attributed to Luqman (c. 1100 BCE). Yet, not only do we have written collections of fables by Aesop, but biographies, hence the information given above. The main biography of Aesop is by Maximus Planudes (c. 1260 – c. 1305), a Greek monk and scholar who lived in Constantinople, the former Byzantium and current Istanbul (Turkey). Planudes was a compiler of the Greek Anthology, yet was also famed for his command of Latin and polished translations of Aesop’s Fables. Planudes published the first annotated collection of Aesop’s Fables. 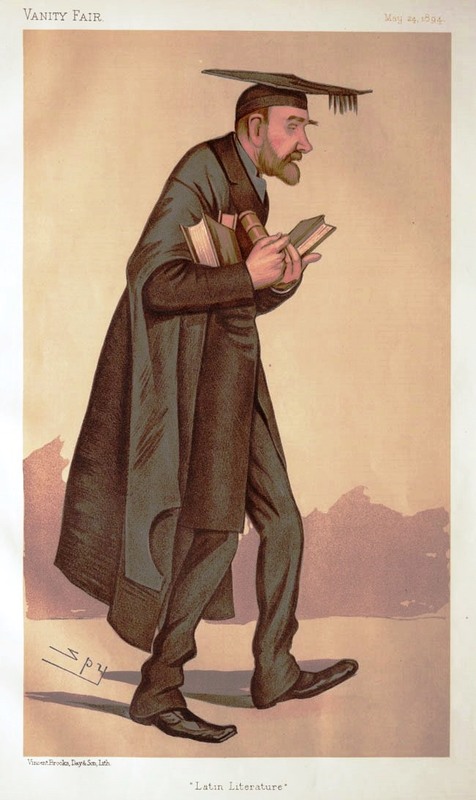 La Fontaine also wrote a short biography of Aesop entitled La Vie d’Ésope, le Phrygien. It prefaces his first collection of fables, 6 books, published in 1668. La Fontaine’s second collection shows the influence of fables originating in the Sanskrit Panchatantra by Vishnu Sharma and versions of Abdullah Ibn Al-Muqaffa‘s Persian Kalīlah wa Dimnah, fables based on the Panchatantra. There are two more renditions of Kalīlah wa Dimnah, but all three are linked to one another and to the Panchatantra because the story-teller within the book is Pilpay, Bidpai, or Bidpaï. Kashefi’s Anvār-e Soheylī, or “The Lights of Canopus” (15th century) Persian. However, La Fontaine had not read Gaulmin’s Livre des lumières when he wrote his first volume of fables (6 of 12 books). “Le Conseil tenu par les rats” (“The Mice in Council”) is included in La Fontaine’s first of three recueils (collections) of fables, published in 1668, 1678, and shortly before 1695, the year he died. In the absence of a text, Aesop’s Fables have been considered an example of the oral tradition, fables transmitted orally from generation to generation. It seems Aesop’s Fables did not enter a “learned” tradition until Latin author Phaedrus, who lived in the 1st century CE, published a book of fables attributed to Aesop (Gutenberg [EB #25512]). So did Greek author Babrius (Gabrias), in the second century CE. Babrius may have been a Levantin (from the Middle East). A third early translator of Aesop is Flavius Avianus (400 CE/5th century), the author-translator of 42 Aesopic fables. However, “The Mice in Council” is not included in Avianus’ translations. After some reflection, I looked for a copy of the Ysopet-Avionnet on the internet and found “The Mice in Council.” The Ysopet-Avionnet is a collection of fables that was used as a school text from the Middle Ages until the early part of the 20th century. It is an Internet Archive publication, p. 191, printed near the end of the book (please click on Internet Archive). 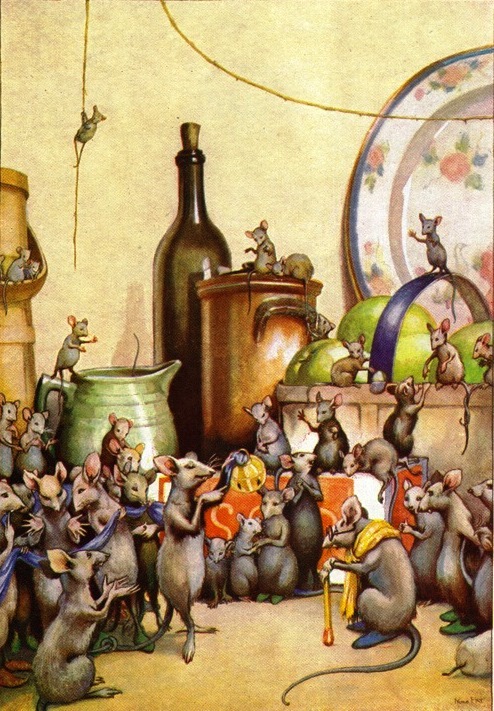 In the Ysopet-Avionnet, “The Mice in Council” is entitled “Des Souris qui firent concile contre le chat”(“De muribus concilium facientibus contra catum”). However, the Ysopet-Avionnet’s “The Mice in Council” or “Belling the Cat” seems to have come out of nowhere. 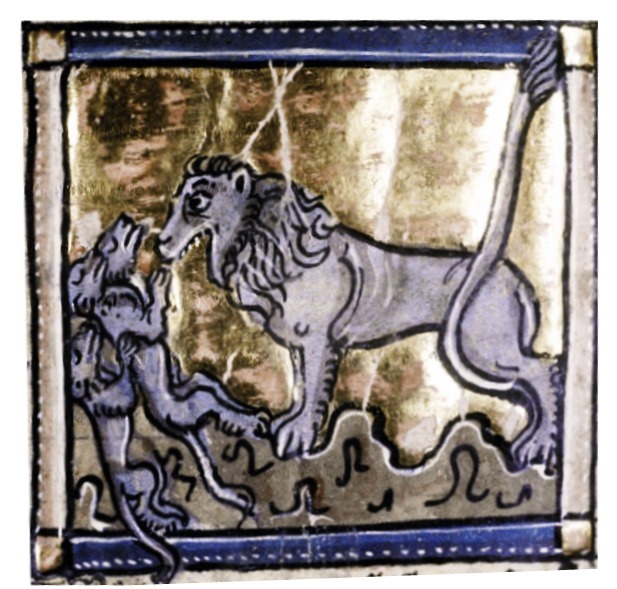 Neither 5th-century Avianus nor 12th-century Anglo-Norman fabulist Walter of England, Gualterus Anglicus, wrote a “Mice in Council.” Yet, the fables published in the Ysopet-Avionnet are by Walter of England for the most part. Walter of England, who wrote in Anglo-Norman, is also known as the “anonymous Neveleti.” The Neveleti we know is Isaac Nicholas Névelet, the Swiss author of a 1610 Mythologia Aesopica, La Fontaine’s main source. Laurentius Abstemius‘ Hecatomythium (1495) is the source of Sir Roger L’Estrange‘s Fables of Aesop and Other Eminent Mythologists (1692). A collection of fables by Aesop had been printed and possibly translated by famed English translator and printer William Caxton, in 1484, too early to include Abstemius’ “Mice in Council.” Caxton printed The fables of Aesop, as first printed by William Caxton, in 1484, with those of Avian, Alfonso and Poggio, now again edited and induced. A third English fabulist was Samuel Croxall (c. 1690 – 1752), the author of The Fables of Aesop; with Instructive Applications. Aesop’s Fables 100 Cuts. Croxall was an Anglican churchman. Moralizing would be his chief objective. The 12th century is a turning-point and a culmination. In fact, it has been called a Renaissance. Marie de France lived at the end of the 12th century and Walter of England published his fables a smidgen earlier but in the 12th century. In France, collections of fables by Aesop were by then called Ysopets or Isopets and became textbooks used in schools. An Ysopet could also be called a Romulus. 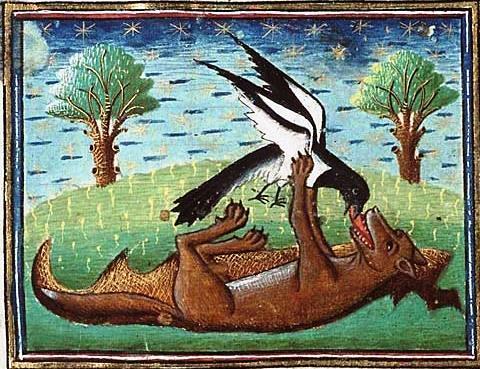 As well, Reynard the Fox was born in 1148-1149 as Reinardus in the Ysengrimus, a beast epic not intended for children. The Romulus of Nilant or (Romulus Nilantinus), 45 fables, published in 1709 by Johan Frederik Nilant (Jean-Frédéric Nilant). These may have been versified by Walter of England Gualterus Anglicus, Alexander Neckam (Novus Aesopus), Adémar de Chabannes (c. 989 – 1034; 67 fables), and other translators or fabulists. French author Marie de France used a Romulus as a source for her collection of 102 fables written in Anglo-Norman. (My copy has 103 fables.) Marie de France is a major author who will be discussed in a later post. Prudence or foresight is the moral of nearly all Aesopic fables. One has to think. Prudence makes it unrealistic for a mouse to try to hang a bell down a cat’s neck. In La Fontaine’s fable, the solution to the rats’ main peril, being devoured by the cat, would cause a rat to be devoured, certain death and, therefore, the greater peril. No rat can bell a cat. In An Argosy of Fables, the translator, Thomas James, has the mice applaud when it occurs to them that they need simply bell the cat. A mouse then gets up and asks the relevant question: Who will bell the cat? In La Fontaine, we have what he calls a comedy: “[u]ne ample Comédie à cent [one hundred] actes divers.” (“Le bûcheron [the lumberjack] et Mercure” [1.V.1].) The cat is named after François Rabelais‘ Rodilardus (the Latin form of Rodilard [round and fat]). There is, moreover, a reference to the French court, which 1s to be expected from Jean de La Fontaine, whose patron had been Nicolas Fouquet. Courtiers waste time. They are mindless. In English, the “who will Bell the Cat” is idiomatic. It has entered the English language and is now proverbial. Fables are the illustration of a proverb, but in our fable the illustration has returned to a proverb, which probably means that the illustration, or exemplum is very powerful. It seems to me that Wikipedia’s view of the provenance of “Belling the Cat” is also very sensible. Frederic Taber Cooper (ed.) and Paul Bransom (illust. 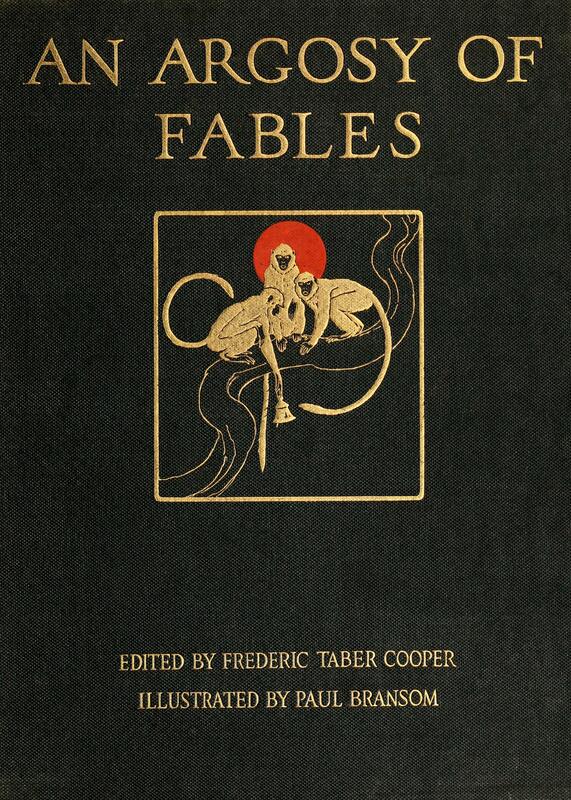 ), An Argosy of Fables, a Representative Selection from the Fable Literature of every Age and Land (New York: Frederick A. Stokes Company Publishers, 1921). The Fox as the Devil, etc. Townsend’s statement reflects an anthropomorphic vision of animals (humans in disguise), as in George Orwell‘s 1945 Animal Farm). 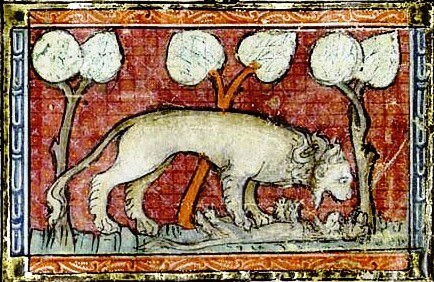 In fables and in beast epics, such as Le Roman de Renart, animals are anthropomorphic. But Townsend’s comment also reflects a will to stereotype animals and transform them into allegorical creatures. In Medieval Bestiaries, they are symbols. There are exceptions to the lore. The real Dog is a very loyal animal. It can sniff out nearly anything or anyone. However, a real Dog does not let go of the prey it holds for the prey it might catch. In other words, the fanciful and the fantastic suffuse Medieval Bestiaries, such as the Aberdeen Bestiary or the Ashmole Bestiary (or Bestiaries). The same is true of several extraordinary medieval beasts, not to mention qualities attributed to birds, stones, and other aspects of nature. The merveilleux FR characterizes more than a thousand years of Natural Histories. It is often called le merveilleux chrétien, a Christian magical realism (the fantastic). so highly individualized that they have names, like human beings. 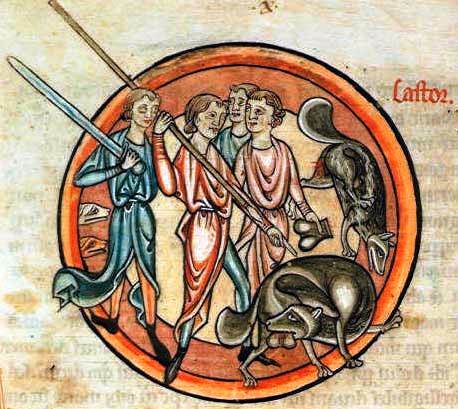 The naming of the Roman de Renart‘s animal cast begins with the Ysengrimus (1148-1149), the birthplace of Reinardus (Latin) who becomes Renart beginning in 1274-1275, when the first “branches” of the Roman de Renart, written in “Roman,” the vernacular, were published. 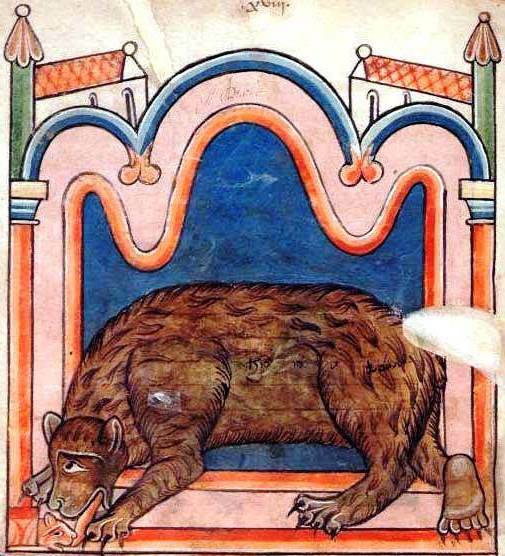 Animals in the Medieval Bestiary are seldom presented with animal attributes, with the probable exception of illuminations (enluminures FR). 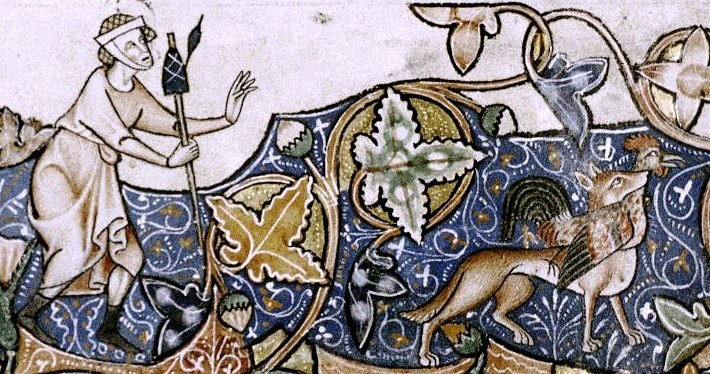 In other words, beasts inhabiting the Medieval Bestiary are stereotypes, or archetypes. Deviousness is the Fox’s main attribute, but it is a literary attribute, by “universal popular consent.” In fact, Medieval Beast literature is an example of intertextuality EN, a term coined by Julia Kristeva in 1966. Intertextuality is a theory according to which texts are rooted in an earlier text or earlier texts. One could also use the word palimpsest. Pliny the Elder, however, does not mention deviousness with respect to the fox. What Pliny reveals is the birth of incomplete offspring that have to be licked into shape. I have yet to find an image of the Fox licking its offspring into shape, but Bears and Lions also lick their incomplete progeny into shape. 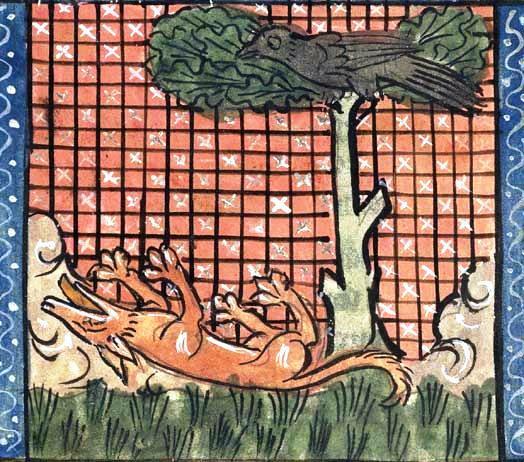 (See Fox, in The Medieval Bestiary.) Although this characteristic, i.e. licking into shape, was noted in Pliny the Elder’s Naturalis Historia, or Natural History (published c. 77– 79 CE), it may have entered animal lore long before Pliny was born. As noted above, I have not found an image of the Fox licking unfinished foxes into shape, but I have found images of Bears licking their cubs into shape and Lions breathing life into lions born dead. Animal “lore” also presents a second image of the Fox. 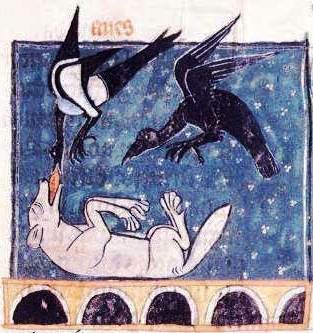 We have seen that in “The Crow and Fox” (« Le Renard et le Corbeau, » (La Fontaine I.3) the fox flatters the crow into singing and dropping its dinner. But the literary fox also plays dead to catch food, which is yet another manifestation of the fox’s deceptive literary “nature.” The theft of fish is motif number 1 in the Aarne-Thompson-Üther classification system. Abstemius 146, the pseudonym of Lorenzo Bevilaqua. Several Natural Histories were written in Greco-Roman Antiquity, going back to Herodotus‘ Histories. Herodotus described the crocodile, the hippopotamus and phoenix. 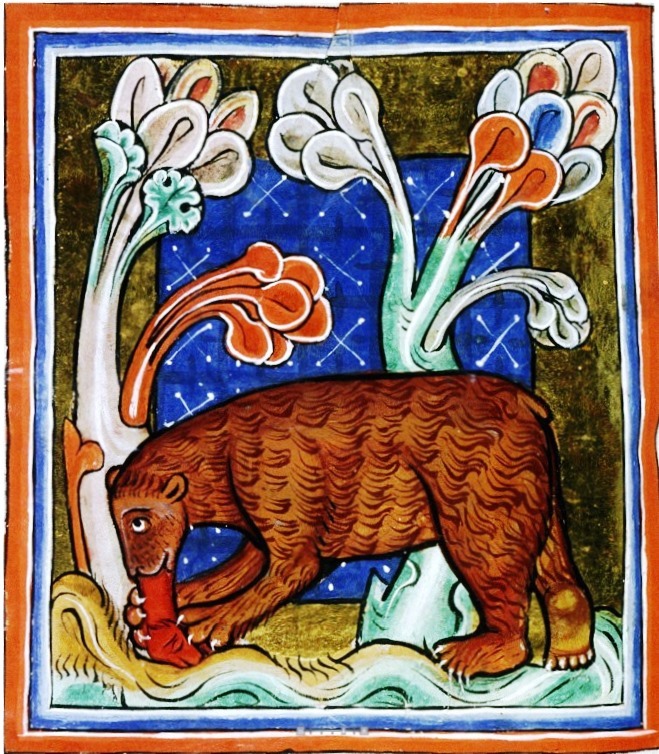 Many Natural Histories were also published in the early Middle Ages. and in Natural Histories are not zoological creatures, but the denizens of literature. They possess qualities attributed to them “by universal popular consent,” which, in the Middle Ages, may have been the consent of Christian “naturalists,” some of whom were monks and scribes. The Aarne-Thomson classification system (motif index) was modified by Hans Jorge Üther, hence the initials ATU. George Fyler Townsend, Æsop’s Fables, Project Gutenberg [EBook #21]. Third paragraph. Æsop’s fables have been indexed by Ben Edwin Perry (1892–1968). “The Beaver” is Perry Index 118. Pliny the Elder died in the eruption of Vesuvius. Jan M. Ziolkowski, Talking Animals: Medieval Latin Beast Poetry, 750 – 1150 (Philadelphia: University of Pennsylvania Press, 1993), p. 3.